The "Irisha" is an Expert Advisor, in which we attempted to implement the ability of trading on smaller timeframes (1-15 minutes). The main idea lies in opening frequent trades and in the ability to "cover" losing trades with profitable ones. However, we had to resort to the Martingale strategy to implement the idea. Due to this, it is recommended to have a large deposit and/or cent account for using this EA. The Moving Average (МА) indicator serves as the signal for opening positions. If the opening price of the candle is below the MA and the closing price is above the MA, this is considered to be a buy signal. The Relative Strength Index (RSI) indicator is used as the signal filter. If the value of the RSI indicator is lower than 30, and a buy signal was received from the MA indicator, a buy order is opened. Change in the direction of market movement. In case the market changes direction after an order is opened, a new buy order will be opened but with an increased lot size. Optimal profit level. In case more than one order is opened, the EA calculates the price level, after reaching which the profitable orders cover the unprofitable ones with the minimum profit percentage. A Pro or ECN (Market/Instant Execution) account with a spread size of 0 to 2 points (but not greater than 2.5) is recommended for the correct operation of the EA on 5 digit quotes. MaxOrders (Maximum number of open orders) - the maximum number of opened orders. You can also adjust the parameters of the Moving Average and Relative Strength Index (such as period, price type, shift, MA method) according to your needs. TrendNeutralZone - uptrend or downtrend based on the RSI indicator is between the values of 'Level overbought' and 'Level oversold' parameters. * Optimized the averaging function. * Added parameters for the signal indicator and for the reversal filter. *Optimized the "Averaging" function algorithm of opened orders. *Added new function for checking the limitation on the number of orders. *Made adjustments to certain functions. -Allowing the EA to open the first order. 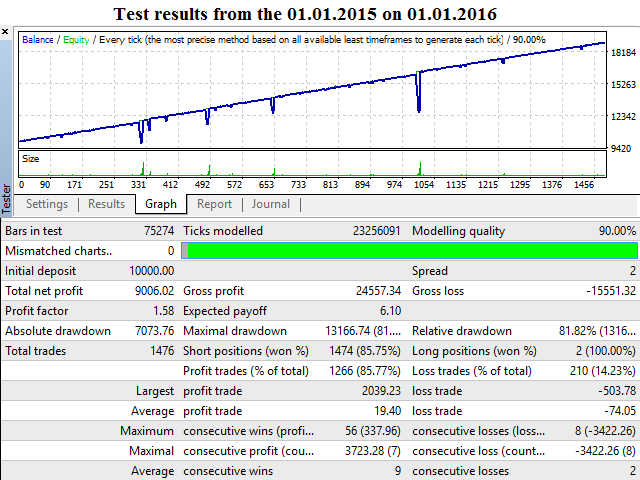 *Fixed the error with the StopLoss parameter missing from the settings. Added the parameters for overbought (Level overbought) and oversold (Level oversold) levels to the settings of the RSI indicator., as well as the RSI_MODE (Definition mode) to set the options for determining those levels. -TrendNeutralZone - The uptrend or downtrend based on the RSI indicator is between the values of 'Level overbought' and 'Level oversold' parameters.